In 1990, after a career changing injury, I turned my full attention to photography. I was disillusioned to find that much of my earlier work from 35 years ago was beginning to show signs of deterioration. I did not want to spend my time working in a photographic art form with materials that caused the print to self-destruct. Since the 1850's it has been well documented that silver-based photographic methods have a lack of long-term image permanence. Living in Tucson, I was fortunate to utilize the world renown resources from the University of Arizona's Center for Creative Photography. I researched how one could make a permanent photograph. There was the cyanotype, an iron process; the carbon print, using graphite; and the platinum print, using platinum metals. Viewing examples of each, I was drawn to the platinotype with its warm tonal scale, and its sharp as a tack image, because it requires a negative the same size as the image. The platinotype image is softened because it is printed on watercolor paper. Since the emulsion is hand-coated, there is an organic feeling about completing the print to the finished product. In looking at early photographic images, I was drawn to three photographers in particular: Eduard Steichen, Edward Curtis and Alfred Steiglitz. All produced portraits of people that captured a soul within them for me. I taught myself how to print, using 6 x 6 cm negatives that I had from my many years of working with a Hasselblad. It was terrific, no darkrooms were necessary, and no more chemical smells. Printing outside in the sun, I felt like a pioneer photographer. I knew then that I loved the process - and the look. But my negatives were small, and so were my prints. I attempted to work with negatives that were enlarged, but found that I could not get the look of the images printed from larger formats. So I began the process of moving up in negative size. That worked well because there was a slight learning curve to hand-coating larger images, 4x5, 5x7 and 8x10. Ultimately, I found a used Wisner 11x14 technical field camera and with that, I felt that I found my niche. Portraiture is my specialty -- large format platinum portraiture. Images that are made to last 500 to a thousand years. Less than 50 people in the world are working in the medium of platinum portraiture. And so, here I am, photographing Native Americans whose own cultural permanence is threatened, and the public, whose individual permanence is never guaranteed (except maybe through a photograph). 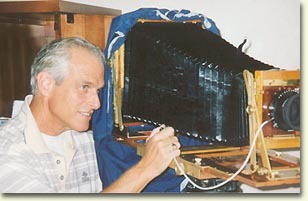 In the process, I hope to educate a public that knows very little about the platinotype and platinum photography. I hope you enjoy the images presented.